If you love coffee, then you must try UCC’s coffee. Yes, UCC Cafe Terrace is relatively expensive compared to the other Cebu coffee shops. However, it is (arguably) by far the Cebu coffee shop with the most number of choices. If wa palang ko nauwaw nila Abbey and Kathleen, naabtan siguro kug 48 years pinili sa drinks na akong sulayan. 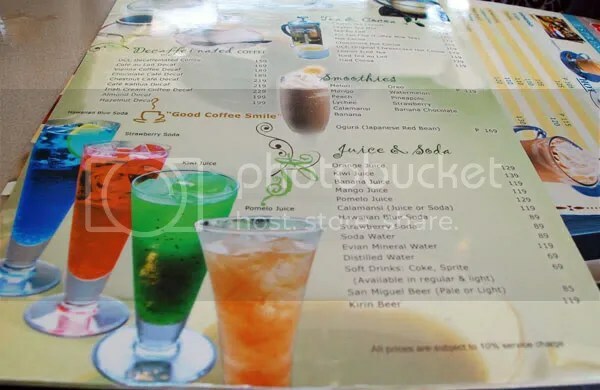 If you’re the type who looks at the entire menu before choosing, ay makahilak ang waitress ug hinuwat hehe. UCC Coffee is not for everyone. 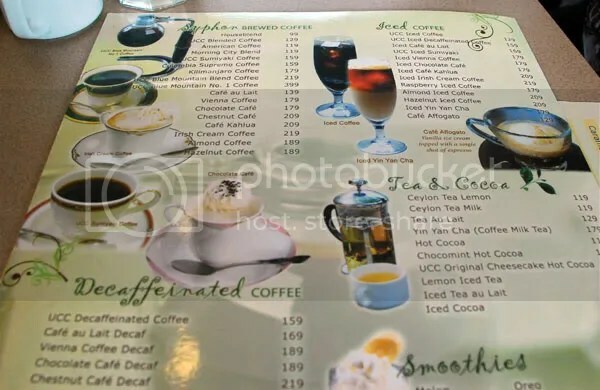 Casual coffee drinkers (me included) would cringe at the sight of SOME of the prices and might not be able to appreciate or be able to tell why their coffee is special. Unlike most coffee shops, UCC Coffee grows coffee beans in its very own plantations in Jamaica, Indonesia, and Hawaii. From planting to roasting and production, UCC is involved in every step. As you can see in the image above, making coffee the UCC way is quite unique – the gadgets alone are fascinating, at least to me. UCC coffee is done via siphon brewing; observing how it is done is like chemistry lab all over again hehe. 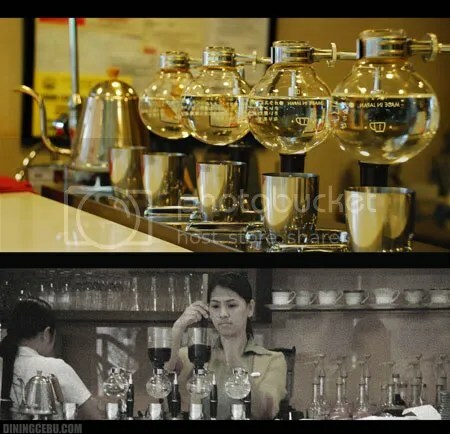 The brewing method is painstaking – fixed number of minutes for the water to boil, fixed number of minutes when stirring, heck you even have to drink the hot coffee within the first five minutes it is served to you or else it is considered stale. No wonder UCC coffee is relatively expensive! (a) UCC Blended Coffee ~ 3 kinds of coffee beans, aroma is nice (if you like coffee! 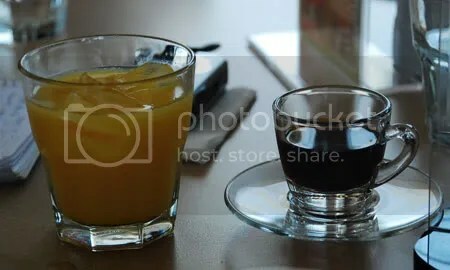 ), and the taste is also okay, not too intense for me. (b) Sumiyaki Coffee ~ charcoal-roasted beans and the aroma is like charcoal indeed according to Berg, but I honestly can’t smell the charcoal. This would be UCC’s version of an espresso. The aroma and taste are more intense than UCC Blended Coffee. (c) Blue Mountain ~ beans from Jamaica and not as intense as Sumiyaki but stronger than UCC Blended Coffee. 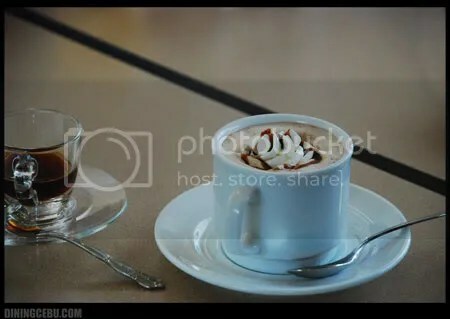 It tastes really good when added with the cream they served, which apparently is made especially for their coffee. A cup of Blue Mountain costs Php 399 as of July 2009. 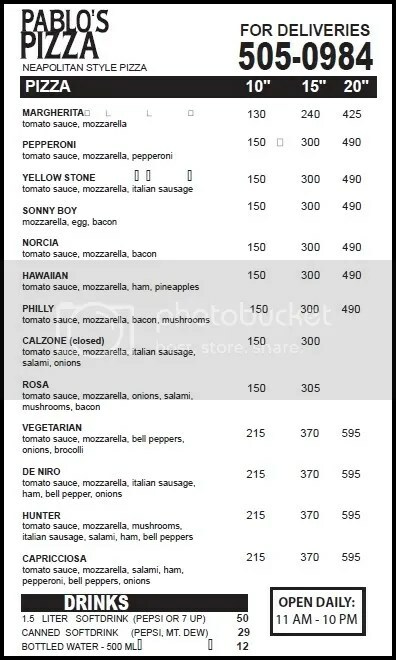 Hay, makatug gyud ka sa price ani pero lami gyud siya. UCC Cafe Terrace also has many ice-blended drinks that are not coffee-based. I like the chocolate and mint combination so I have to go back and order that one or pwede pud ang Blueberries & Cream kay murag lami sa picture. Ay naglibug na ko kay murag lami man pud ning Almond White Chocolate Mocha and kaning Creme Brulee coolers! The good news is ang price kay duol ra sa Starbucks – price range Php 145 to Php 165 although naa pa nuon 10% service charge. UCC also has decaffeinated coffee, but the one I will definitely check out when I go back (soon!) are the tea and cocoa choices. Unya nalang tung coolers ug naa na koy sponsor hehe. I like coffee milk tea so try siguro ko aning Yin Yan Cha but naa man pud Chocomint Hot Cocoa and UCC Original Cheesecake Hot Cocoa! Murag mahurot man sad atung kwarta gyud ug magtambay ta didto pero at least makagamit man pud sa ilang Wi-Fi. For the less adventurous, there are juices and sodas. Eyean, murag dapat gyud ka mopalit aning Banana Juice. Correct me if I’m wrong, but UCC seems to be the only coffee shop that has Evian Mineral Water (ug nganong mahal ning tubiga!). UCC is really not for everyone. But for the “can afford” people of this universe and the coffee connoisseurs, UCC is the place to be. Good Coffee Smile! UCC food and drinks are really delicious. Unfortunately, these are very expensive price-wise especially for the average Cebuano. My wife and I had 2 cups of coffee and 1 slice of cake there and the total price we paid was equivalent to a full meal for 2 at Friday’s. Imagine that? 🙂 We’ll be coming back here pero once a year lang siguro. Hehehe! man that coffee looks really good wish they had some legit places like this over here in the states. Coffee like you said can be very expensive and it all just depends on you. If you need promotions for your business, we sell retractable banner stands, markerboards, chalkboards, and many more display products. Hi guys, thanks for dropping by. Yes, I agree with you Dinno. Maybe UCC can have smaller portions of their food para di kaayo mahal. I enjoyed reading your blog post. Good Stuff! I really love their Beef Hayashi and Curry Rice!! !